The Wedding Ring Bed Runner is a smaller version of our Flowers for my Wedding Ring quilt pattern. 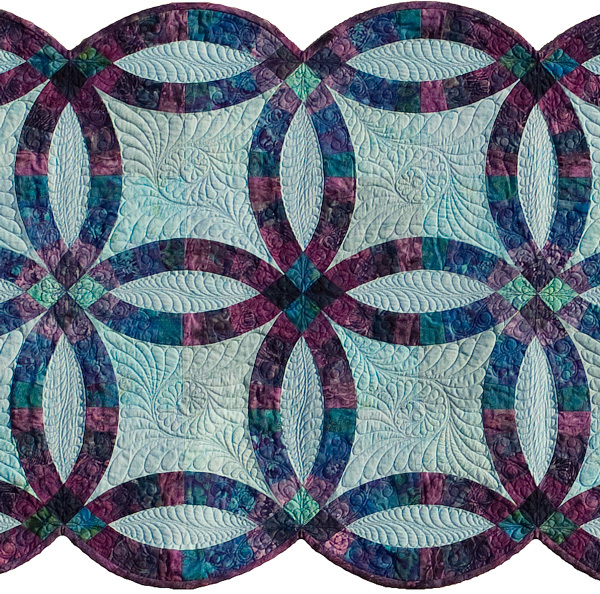 Wedding Ring Bed Runner, Quiltworx.com, made by Certified Instructor Diana Simkins. Wedding Ring Bed Runner Line Drawing, Quiltworx.com, Made by Quiltworx.com. Wedding Ring Bed Runner, Quiltworx.com, Made by Pam Duffy. Deb Peterson Hey girl...we'll have to get together and do this one! Looks like a fun mini retreat project! Bruce Stees Is that what your quilt ring is going to be used for? Jane Beckner Andresano I really enjoyed making one also. Diane Dryden Just got this pattern, can't wait to make this beautiful runner! Connie Goff This is absolutely beautiful!! Misty Paugh Love the colors. .
GlendanJerry Kochany This would make a really nice table runner. Kathleen D. Longstreet Funny - on my 'puter the pix doesn't show until you click in the black rectangle. Tauna Moody I appreciate the beauty of this piece and cant imagine the amount of hours it took to complete it.... fantastic! Marie Cutler Thinking it is a bad photo and the light is not correct to get the beauty of the project! Marie Cutler Nice, but to busy on the stippling! Wedding Ring Bed Runner, Quiltworx.com, Made by Merethe Soby. Mary Godowa-Cristy VERY PRETTY - LOVE IT!!! Heather Roberts Beautiful! Love it! Pat Rapp I. Love it. Maybe I can post mine when I finish! Patti Morris What is a bed runner? I guess my old quilt that is two small for my king could be called that. Jim Connie Lange Very pretty! love the colors. Patsy Parkey So Pretty, love the bright,cheery colors! Bali Bed Runner, Quiltworx.com, designed and Quilted by Judy Niemeyer, Quiltworx.com, as a Table Runner at Quiltworx Retreats, Christmas 2013! Bali Bed Runner, Quiltworx.com, designed and Quilted by Judy Niemeyer, Quiltworx.com...used as a Table Runner on a Long, Table for a Big Family! Maria Josett Por favor me mande este projeto! Neva Elliott Love the colors. Beautiful quilting. Brenda Barnett Retzlaff So pretty. Teresa Elam Ayars I love the blues!